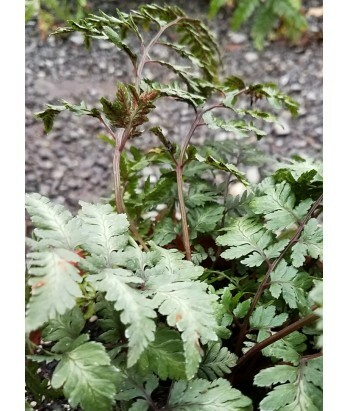 Evergreen fern. The striking silvery fronds are contrasted by green highlights and dark purple stems, giving an overall tapestry effect. The fronds work well in cut flower arrangements, providing lasting color and soft texture. Deer resistant. Ample water needs once established, needs good drainage. Hardy to 0°F.